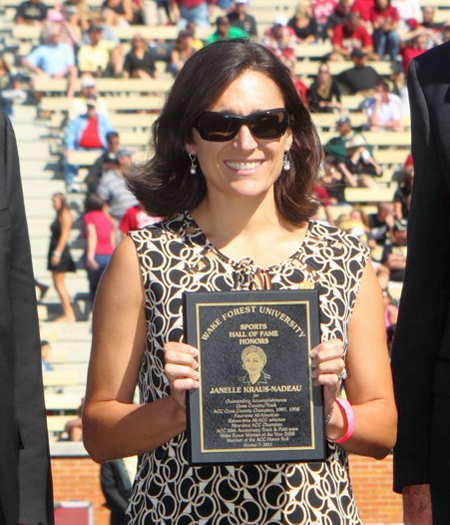 CLIFF CLARK PHOTO | Janelle Kraus-Nadeau at Wake Forest, accepting her award and induction into the Athletic Hall of Fame. What do these athletes all have in common: U.S. Open champions Arnold Palmer and Curtis Strange, Super Bowl champions Jim Clack of the Steelers and Ricky Proehl of the Rams, Bears running back Brian Piccolo, three-time NBA finals MVP Tim Duncan, 2000 U.S. Olympic discus thrower Andy Bloom and Shelter Island’s homegrown running star Janelle Kraus-Nadeau? They all excelled in their sports at Wake Forest University and they are all in the Wake Forest Athletic Hall of Fame. Ms. Kraus-Nadeau joined those superstars and a host of other Olympian, All-NFL, All NBA and PGA tour winners in Winston-Salem, North Carolina on Friday, October 7, when she and four other former Wake athletes were inducted into the university’s 2011-2012 Hall of Fame class. The Hall of Fame honors those individuals who graduated at least 10 years ago and “who by the excellence of their athletic achievement or the association with athletics on some level have brought recognition and esteem to themselves and Wake Forest University,” according to the school’s bylaws. Ms. Kraus-Nadeau, a 2001 Wake Forest graduate, has the very rare distinction of being voted into the Hall of Fame in her first year of eligibility. The next youngest of the five inductees this year was soccer player Neil Cavone, who graduated in 1991. The daughter of Linda and Chuck Kraus and granddaughter of Ceil and the late Charlie Kraus of Shelter Island, Ms. Kraus-Nadeau’s first race ever was the Shelter Island Women’s 5K when she was in elementary school. That race finished in front of what was then Kraus’s Restaurant, now Sunset Beach, which was owned by her grandparents. The event later evolved into the very popular Shelter Island 5K Run, which was held last weekend. Janelle doesn’t remember her time that first year but she had fun and wanted to run more races. Years later, after stellar high school and collegiate careers, she came back home and won the mixed gender race outright in 16:47, which is still the women’s course record and the third fastest time ever run on the course by anyone. Last week’s winning time was 18:05, which Ms. Kraus-Nadeau could run herself today. In her high school career, Ms. Kraus-Nadeau ran unbeaten for four years in League 8 and Suffolk County Class C/D competition in cross country and track. She was All-State in cross country three times, won the New York State Cross Country C/D Championship her senior year and was selected to the All Northeast cross country team her senior year. She still holds the fastest girl’s time ever run at the Indian Island 5000 meter cross country course at 18:43. She holds the Shelter Island school records for the cross country 5000 meters (17:54)) and the 1500 meters (4:42) and 3000 meters (10:30) on the track. She earned a track scholarship to Wake Forest and graduated with a history degree. As Mr. Wellman said, she “is considered the most highly decorated woman’s track athlete in school history.” To earn that comment at Wake Forest, she recorded remarkable times of 17:02 for 5K cross country; 16:06 for 5K on the track; and 33:31 for 10K on the track. Post-college she ran 1:13:51 for the half marathon and 2:40:09 in the marathon. She ran in the 2008 Olympic Trials Marathon but injury kept her from demonstrating what she was truly capable of. Ms. Kraus-Nadeau has enjoyed an amazing running career and has been honored well by her alma mater with this Hall of Fame induction. In addition to the Wake Forest recognition, she was also has been named to the Atlantic Coast Conference 50th Anniversary Track & Field Team and is considered one of the top 50 athletes of all time in all sports in ACC history. They are amazing accomplishments for anyone but especially a young woman from a high school with only 75 students and not enough runners to make a full track team. Ms. Kraus-Nadeau now lives and coaches cross country in Madison, Connecticut with her husband, marathoner and nutritionist Bill Nadeau and their four-month-old daughter, Josephine.